Air Source and Ground Source Heat Pumps explained. Heat Pumps use the same basic technology as refrigerators, a well established and understood technology which is over hundred years old. 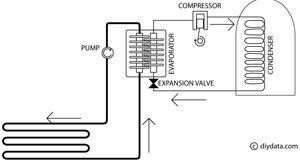 A compressor circulates a refrigerant liquid around a closed circuit, causing the vapour to condense and then, after passing through an expansion valve, to re-vapourise. When a liquid is vaporised, it absorbs heat and when it condenses it releases that heat in what is known as the Vapor Compression Cycle. When used in a refrigerator, the Evaporator, where the refrigerant is vaporised and the heat absorbed, is within the fridge and the Condenser, where the refrigerant is condensed and the heat released, is outside; in effect, the heat is 'pumped' out of the fridge and the heat dissipated to the surrounding room. When used in a heat pump, the requirement is to use the heat released at the Condenser, usually to heat water which can be used for space heating or domestic hot water. To keep the system working, it is necessary for the heat removed at the Evaporator to be replaced - this is achieved, depending on the arrangement, by moving air across the evaporator (as in an Air Heat Pump) or water moving across it (as in an Ground Source Heat Pump). An Air Source Heat Pump looks like a sort of Air Conditioning Unit, it uses a fan to draw air over the Evaporator to replace the heat extracted. A Ground Source Heat Pump uses a length of pipework, either buried in the soil, or laid at the bottom of a river or pond, to circulate a liquid (typically a glycol/water mixture) heated by the soil/water over the Evaporator. For a Heat Pump to be of practical use, the amount of heat generated has to be greater than the electrical energy used to operate the system (otherwise, why not use the electricity to heat the space?) At first sight, it may seem that you are getting 'something for nothing', but in fact you are just concentrating the heat energy. The coefficient of performance (COP) is used to quantify the amount of energy produced by a Heat Pump for 1 unit of energy input - typical values quoted for domestic installations are between 2.5 and 3. However the coefficient of performance is better when the temperature difference between the Evaporator and Condenser is at its smallest; so using the heated water in low temperature underfloor heating or oversize radiators will give improved effeciancy. The COP for Air Source Heat Pumps will be reduced in winter when the need for heat is probably at its greatest at the same time as the outside air temperature is at its lowest. This suggests that Ground Source Heat Pumps may be preferable as the temperatures in the soil or at depth in water will tend not to vary so much over the year - but their installation is more costly and does require a considerable area for the soil/water heat exchange. Where alternatives fuels are available, such as mains gas, it's unlikely that a Heat Pump would make economic sense as the cost per unit of electricity is unlikely to be the lowest even taking into account the multiplying factor of the COP. In addition, purchase and installation costs of a Heat Pump and associated equipment is likely to far exceed those of a more conventional heating system. Heat Pumps are sometimes considered to be environmentally Green, however unless the electricity used is from non-carbon generation, using a Heat Pump just moves the carbon release to a remote Power Station.